Wilmington, Delaware, is one of those cities that feels more like a small town. Neighbors know one another, and businesses cater to the needs of the citizenry. But what happens when the local car salesman suffers one lost sale too many, when one more customer decides to buy from the competition because the price is too high, interest rates aren't friendly, or that shade of blue just won't work? 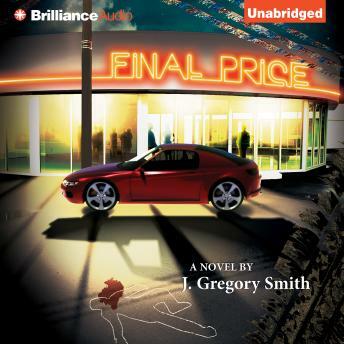 In J. Gregory Smith's electrifying thriller, Final Price, Shamus Ryan's frustration works like a thorn under his skin until psychotic urges take over and he commits murder - serial murders, in fact - his victims chosen from prospective clients who dared to walk away. With Smith's chilling scenes, listeners are pulled into the vortex of a warped mind, one man justifying heinous acts, and two detectives running a race against time, trying to solve seemingly random killings. Paul Chang, a Chinese-American homicide detective, is struggling to understand why these murders are taking place. Assisted by his neurotic partner, Nelson Rogers, Chang goes after the killer with logic, tenacity, and no small measure of fear. Written from the perspectives of Detective Chang and Shamus Ryan, listeners quickly find themselves seeing the world in unique - and often disturbing - ways they never expected. With dark humor and gritty suspense, Smith has crafted a refreshing and surprising thriller.